Our Fair Isle Artisans collection celebrates a quintessentially British garment worn by early twentieth-century explorers, by 1920s royalty and by the style conscious for decades. Often described as 'masterpieces’, Fair Isle jumpers have been continuously knitted here for centuries. This collection makes it easier and more accessible than ever to buy luxurious, hard-to-obtain, handmade-in-Fair-Isle garments. Each Fair Isle Artisans piece is carefully designed, and traditional shapes skilfully adapted, in this timeless-yet-contemporary collection. Naturally, we only use the 100% Shetland wool that’s renowned for its softness, light weight, double-layered warmth with stranded Fair Isle knitting, and breathability. 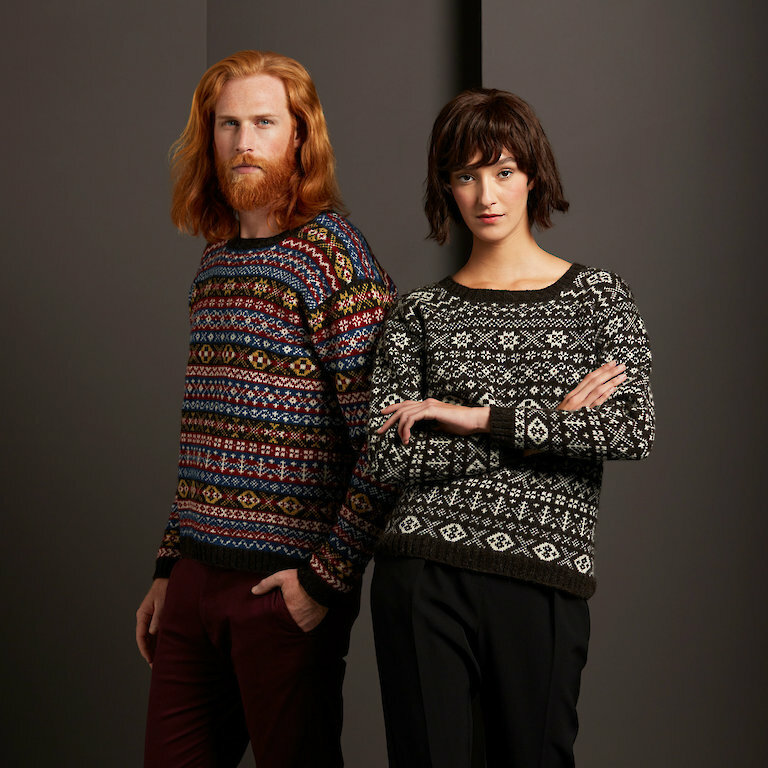 Every garment is handcrafted in Fair Isle, using vintage 1960s hand-frame machines to shape-knit its panels. Next, they’re hand finished to create seamless joins and invisible seams, hand washed with natural soap and flat dried. The final detail, recording the special bond between garment and artisan, is labelling with the knitter’s and hand finisher’s names and the completion date. George Waterston, the visionary conservationist who acquired Fair Isle in 1947, and later sold it to the National Trust of Scotland, famously said, ’Fair Isle knitwear should be considered a luxury item.’ His belief in Fair Isle knitwear underpins the aims of our Fair Isle Artisans collection. Fair Isle patterns and skills have been passed down across generations. The knitwear in the collection draws on these patterns and the artisanal skills used during the 18 hours it takes to knit and hand finish a typical garment. Each is a bit of island craftsmanship. In fact, it’s a little piece of Fair Isle that until recently could only be acquired by visitors. With just 55 residents, an ageing population and no new homes, Fair Isle’s artisan workforce and centuries-old skills are under extraordinary pressure. Only three artisan businesses currently craft authentic Fair Isle knitwear here. With global resurgence of interest in artisanship and sustainable fashion, impossibly long waiting lists reflect the unprecedented demand for Fair Isle garments. The Fair Isle Artisans collection is a proactive response to this skills shortage with education, apprenticeships and internships. It’s a carefully considered rejoinder to local supply’s inability to satisfy the overwhelming demand for authentic garments made on Fair Isle. Furthermore, our initiative encourages and fosters the transfer of traditional skills while supporting current and upcoming artisans. 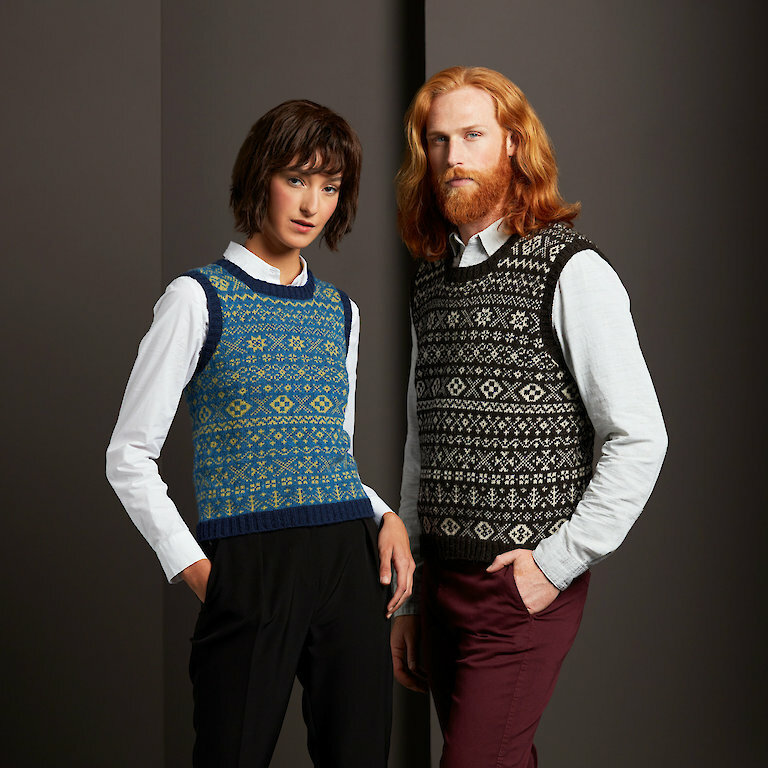 Ever wonder what happens when a round-necked 1970s interpretation of classic nineteenth-century sleeveless knitwear meets Fair Isle’s knitwear tradition? The classic sleeveless V-neck style of iconic nineteenth-century sleeveless country attire meets Fair Isle’s knitwear tradition. Here’s our take on classic fishermens' keps that have made Fair Isle knitwear world-famous since the nineteenth-century. Our favourite hats inspired by the brave seamen that navigated the North sea. Whether a long hat or a ski hat make sure this winter you keep warm in style. Copyright © 2014 - 2019 Fair Isle Knitwear Ltd. All rights reserved.